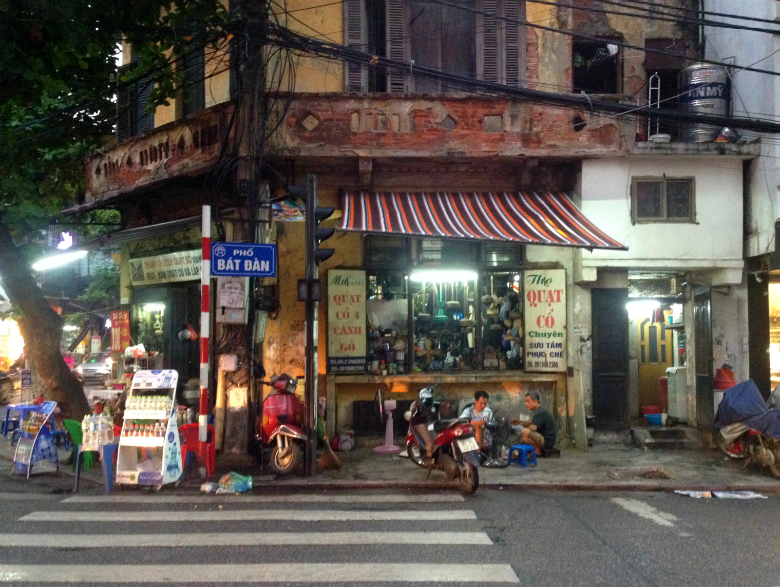 Hanoi appears chaotic but it runs like clockwork. 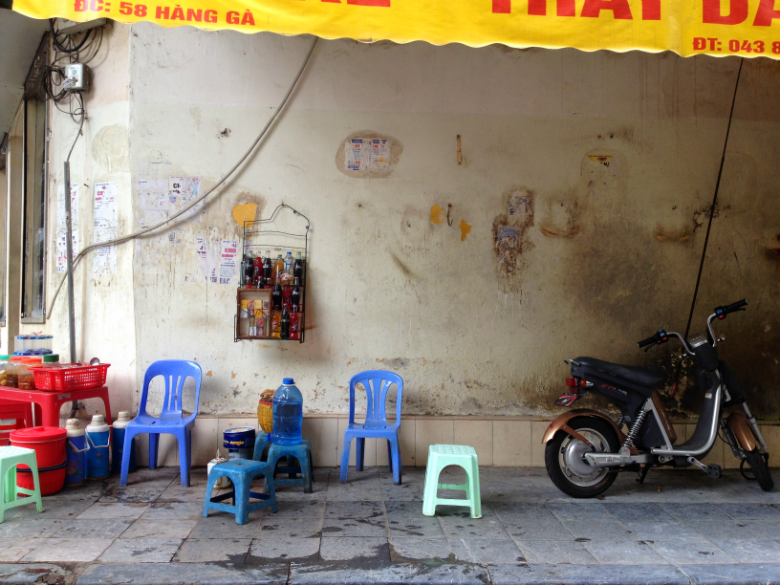 History seeps out from the delicate decay of the city where an intricate pattern of routines, built up and layered together over the days and years, slot together perfectly to form the daily life that happens day-in, day-out between the crumbling French walls of Hanoi. 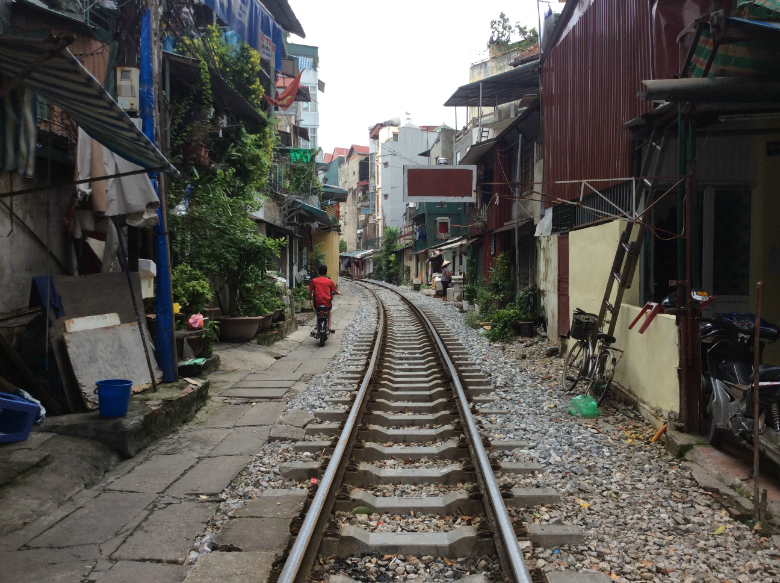 Everyone in Hanoi has a purpose, filling the cracks of what needs endlessly doing, and if they don't, they find themselves one. Even the man sat on the corner of Bat Dan overcharging for cigarettes late into the night is a part of the face of Hanoi, just trying to make a living. Persevering with the grind of life. From the ladies earning just dozens of dollars a year to send their children to school in their home villages, selling fruit from the heavy baskets hanging from the bouncing bamboo shoulder stick, persistent from early morning to late at night, every restaurant owner, tour seller, doughnut peddler, street cleaner, moped parker, rubbish collector, cyclo driver, shoe polisher, the man who takes apart old fans, the boy who holds the door open for you at your hotel, the office workers stopping for a small snack at the roadside stall perched on tiny stools, the young army who guy tells you when you are too close for comfort to the military base - gun slung across his chest for the day - all of them and the rest hidden away, all of them make up the city of Hanoi. 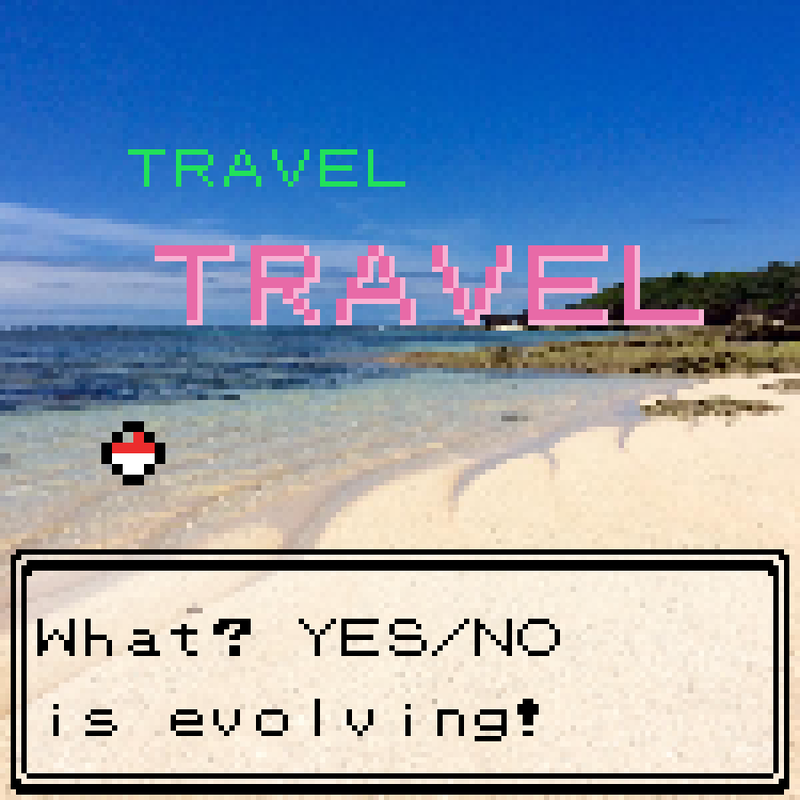 Tourists don't fit with the swirling surroundings. 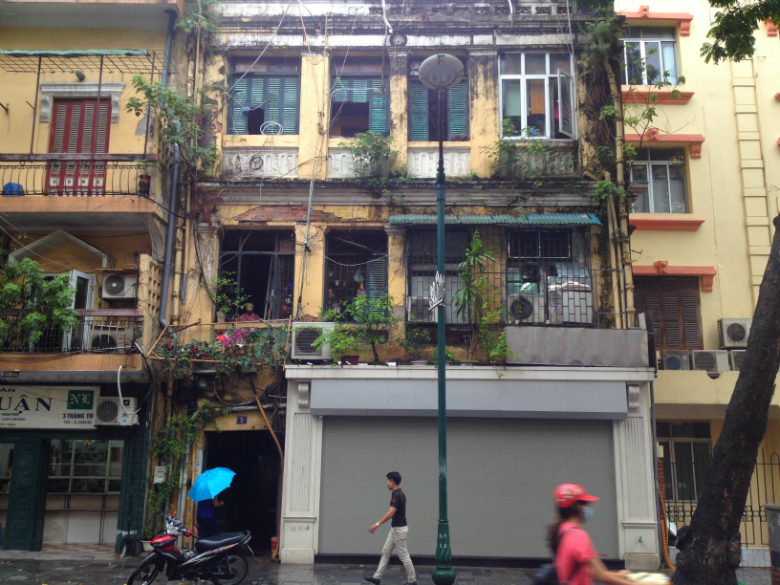 Westerners look like Duplo toys in a Lego set, or Little Tykes in a Playmobil box, finding a Minecraft character in a lush Zelda world, bulky and overgrown, too big and ungainly for the delicately divine decay of old-time Hanoi. Too long-limbed and ungainly. Backpackers and balding adventurers belligerently bowl their way through the ordered entropy, either entirely puzzled or overly confident. We were lucky enough to make friends with two local students from Hanoi. We met Sammi on the train journey down to the China-Vietnam border at Hekou when her friendly face came buzzing over to chat. We could tell straight away that she was from Vietnam. 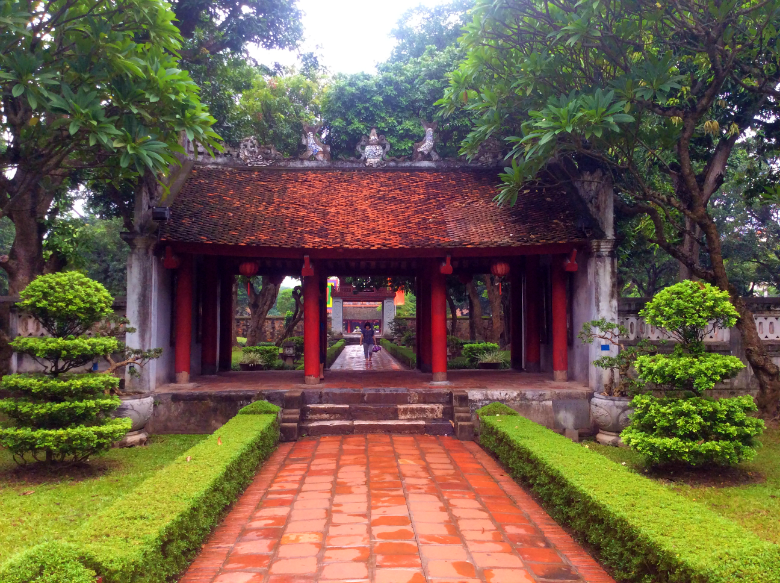 She beamed into a smile when she spoke to us, her dark eyes curious—"Are you going to Vietnam too?" She openly offered up conversation. "Yes we are!" She had been in China as part of a university program and was heading back home when we met her. We talked about finer details of travel plans and made friends, both of us bemoaning the limitations of the internet in China and laughed about how stupid it is that Facebook is banned there. We plan to cross the border together and meet up in Hanoi where she studied. A connection made with a spark of a person in the space of five minutes between stations. That evening we met up with Sammi, who brought along her friend Emma. Together they zipped us off to the night market on the back of their motorbikes. The busy streets were perforated with thick smoke as locals crouched on the pavements outside their homes and businesses and burnt money over street side fires. Emma explained to us that it was a spiritual practice to do with the new moon. We parked the bikes and left them in the care of a guy who keeps an eye on them, for a small fee. It was the weekend and and area of the old city was closed off, the ordered chaos of traffic replaced by stalls, buskers and bars. An electric energy filled the lanes. Ubiquitous plastic tables and chairs spilled out from restaurants across the pavements and into the road, clothes and trinkets were sold cheaply after a spot of bartering and tasty food can be sampled along the way. Sammi and Emma took us to a bar where we all drank beer and they order us some snacks to try. We chat about what kind of music they like, boyfriends, travel, their studies and what both of them would like to do when they graduate. They were both kind, warm and welcoming to two strangers to their city. 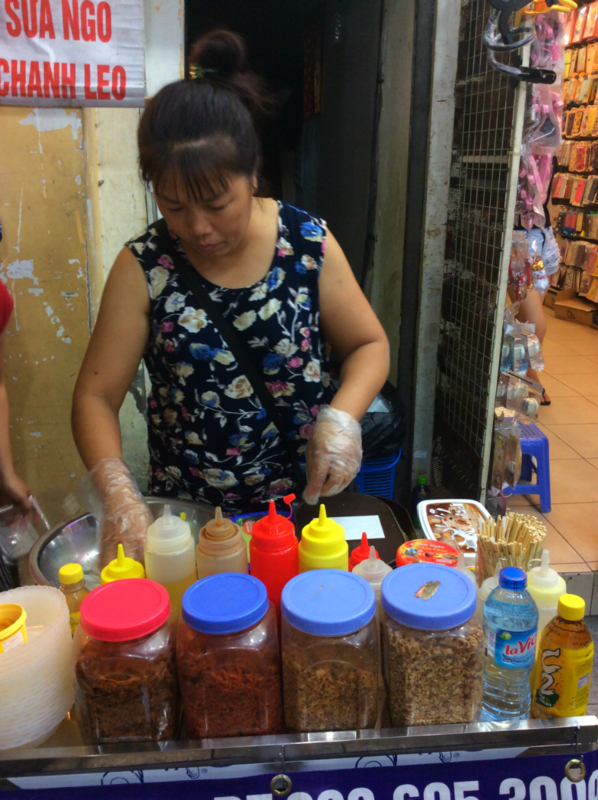 Sammi took us to try bánh tráng trộn from a street stall: it's one of her favourites. It was a tasty combo comprising flimsy rice paper (bánh tráng), green mango, quail eggs, a trio of dried squid, shrimp and beef, garnished with a bunch of coriander and chilli powder. We walked around the market eating and talking about differences in culture and the places we have been. Sammi rolls her eyes at the elephant print trousers and 'Chinese hats' that are clearly all aimed at tourists, and is more than clear on her stance that Taiwan is its own country, an indication into the relative openness and understanding of global politics of Vietnamese youth. We are overwhelmingly thankful for their company. 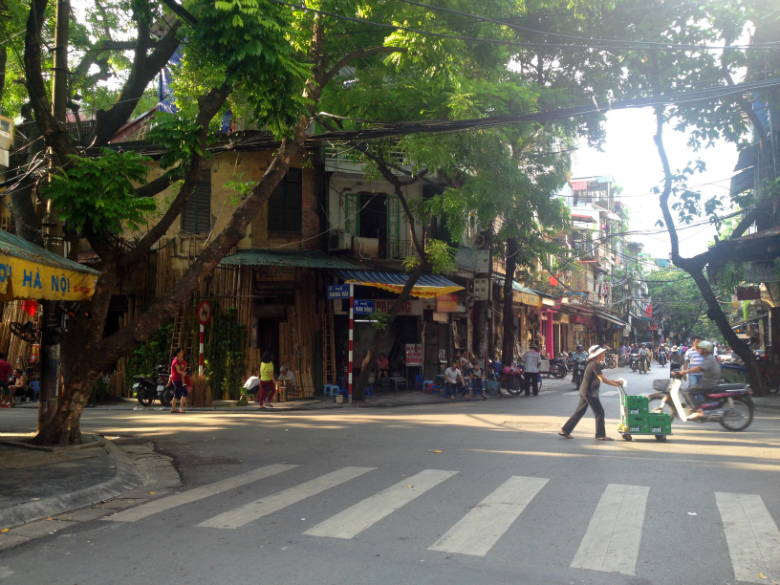 They give us tips about what to see in Hanoi and names of food we should try. 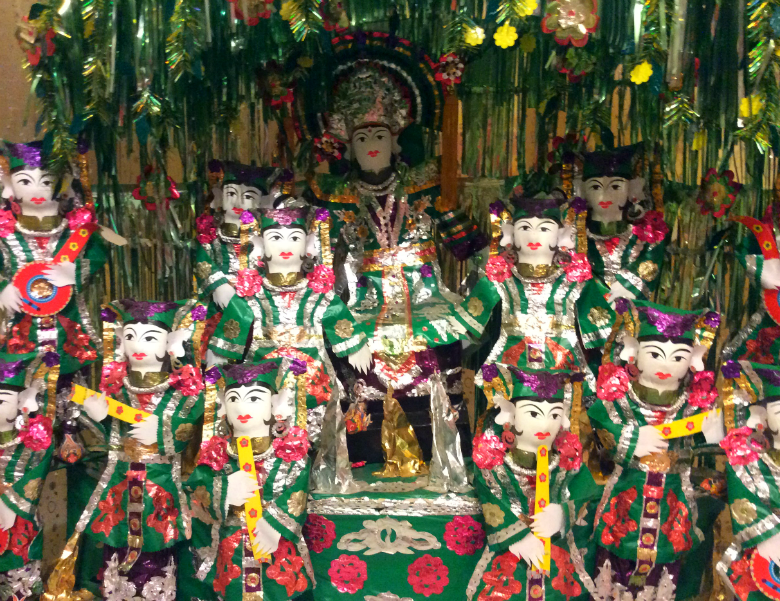 We follow the girls' tip and visit The Temple of Literature. 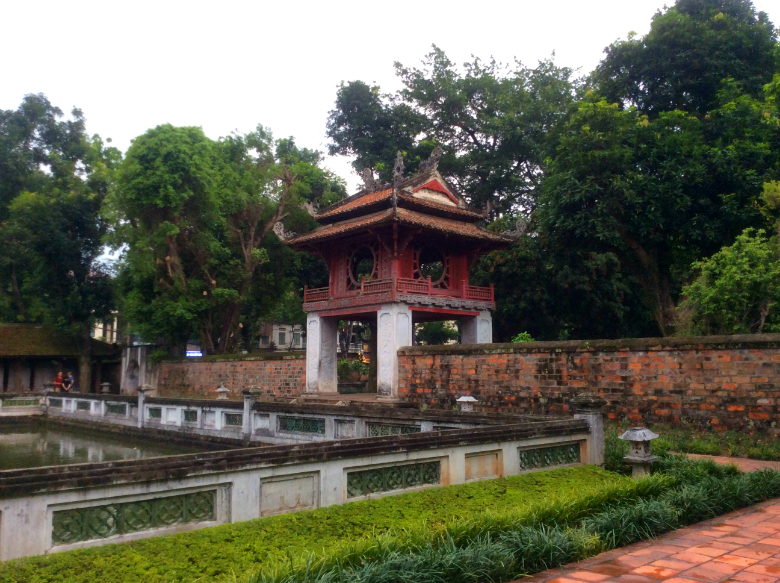 This Confucian temple was the first university in Vietnam dates back to 1070 and still stands despite war, disasters and various restorations. Moving through the temple complex its intriguing engravings and unusual statues catch the imagination, the satisfying symmetry unfolds like entering a real world version of an artistically crafted computer game. 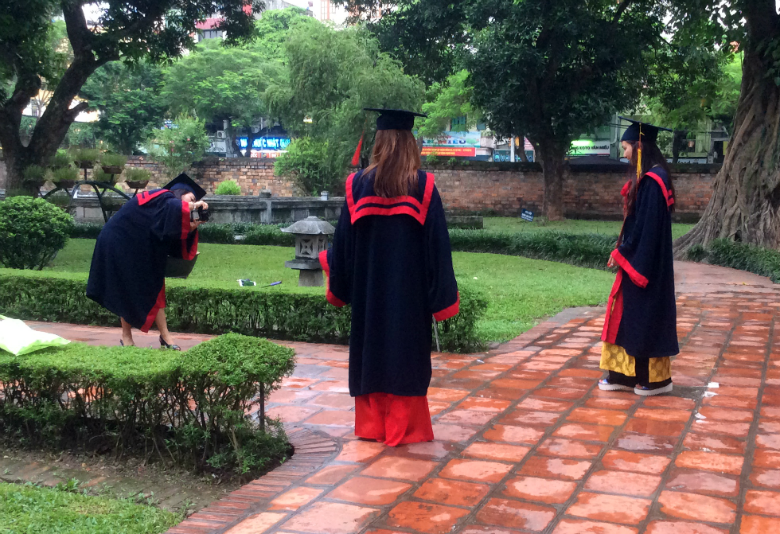 The temple is still a living part of an evolving city with ceremonies and celebrations taking place there annually—as we leave, a group of girls in graduation gowns pose for photoshoots against the iconic scholarly backdrop. Contrasting enigmatically with the decrepitude of the classical French architecture is the emblematic starkness of the city's Communist structures. 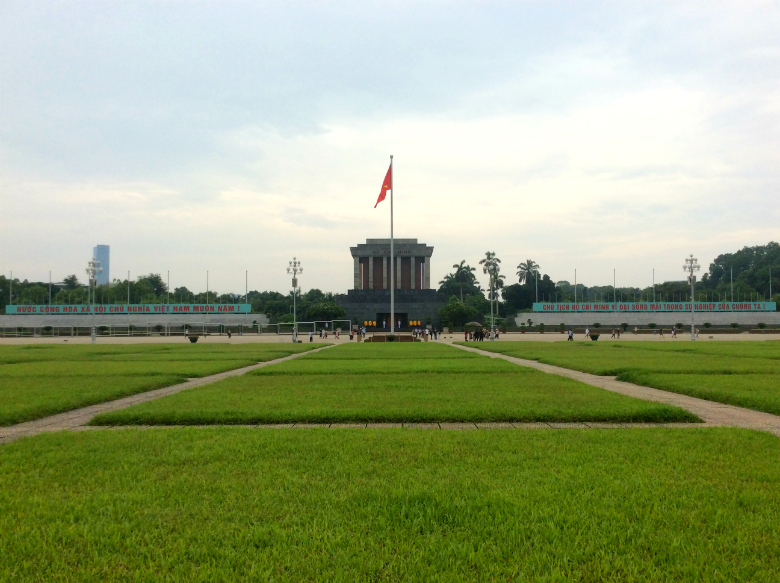 The revolutionary Vietnamese leader Ho Chi Mihn lies embalmed in a mausoleum for all to see. Set amongst wide open empty spaces between the grey square brutalist buildings, it's a stark and jarring collectivist dedication to Uncle Ho's impact on the trajectory of Vietnam's political history. 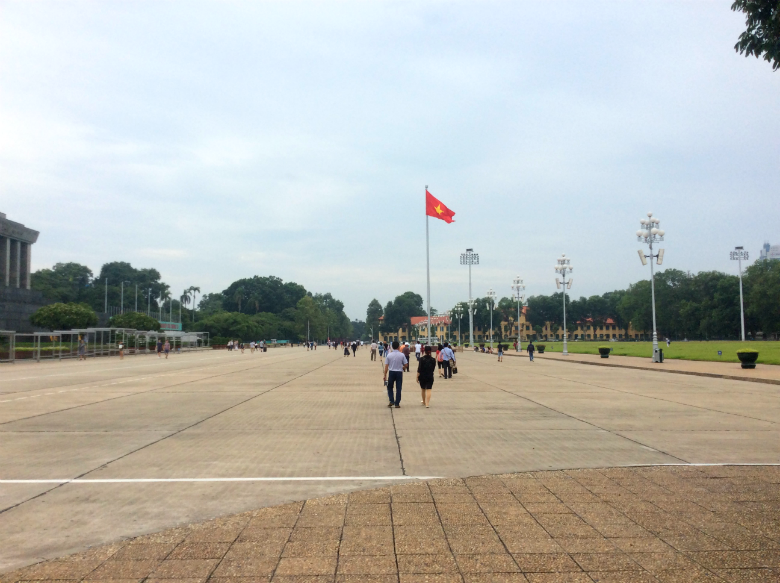 The area is underwhelming compared to the enveloping artistic appeal of the old town, but given the socialist values that remain ingrained in the nation's psyche it's an important place of remembrance and a symbol of Vietnamese patriotism. The people of Hanoi work hard; in fact, look anywhere in Hanoi and you will see women working especially hard. Women have been working really hard for Vietnam for a really long time. 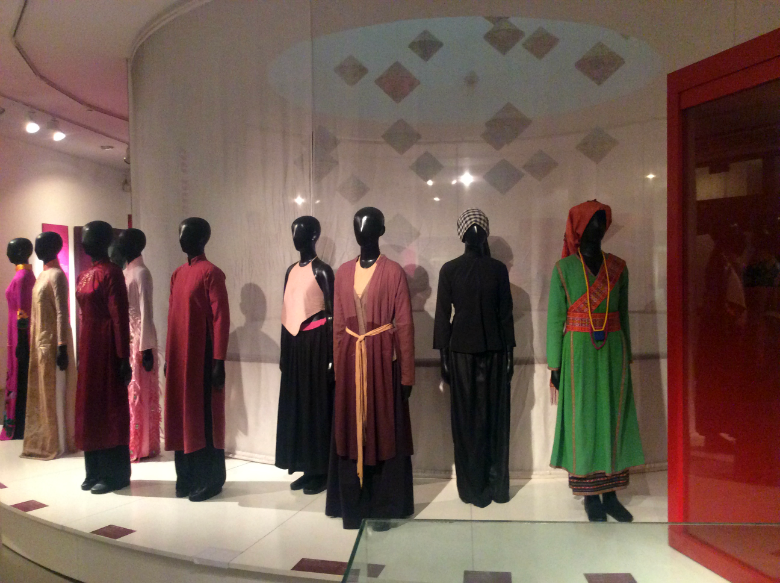 We visited the city's Women's Museum and gained an understanding of the integral role that women played in the war effort, both for independence and against America. Making daring raids and fighting as well as tending to the sick and wounded, cooking and raising children—all of this, fighting for stability whilst maintaining it on a smaller scale, under the uncertain shroud of combat and conflict. 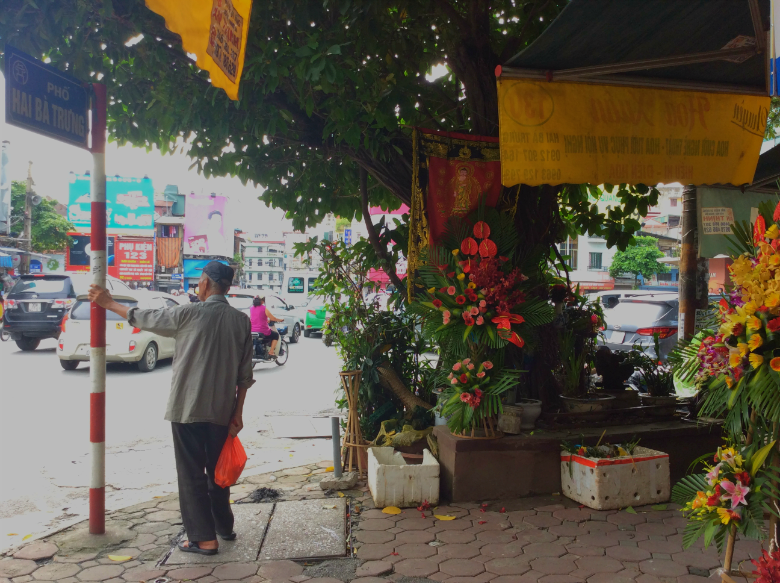 English signage weaves stories of specific Vietnamese women's lives, the broader historical and cultural importance of women in the country, and illuminates Vietnam's different ethnic minorities and their traditions. In one alcove a short documentary focused on the women who travel from small villages to make money in the cities by selling fruit and various other things, giving context and a voice to the women who spend a lifetime working on the streets of Hanoi. You can even test the typical weight of the baskets balanced on each end of a bamboo pole by these ladies. We left the museum with a newfound respect and understanding for the women who work all day for measly money, spotting not just another bamboo pole-carrying street peddler but a person working hard, hustling for a better future. 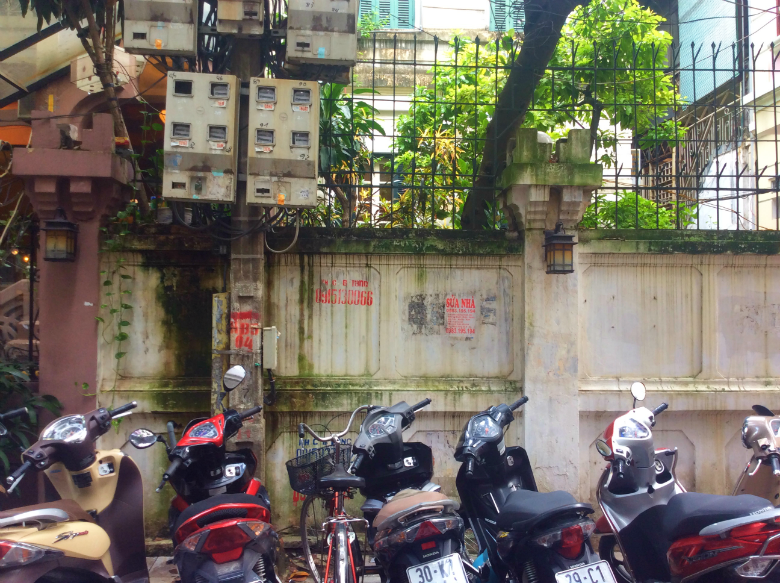 We spent much of our time in Hanoi walking around the maze of roads and alleyways, seeing ancient faces to match the crumbling façades of buildings and discovering a time capsule of a city infused with the iPhone buzz of the modern world. Days dissipated as we sat at roadside cafes, sipped ice coffee and watched the intricate workings of the world around us. That's the tender anguish of being somewhere like old Hanoi: it's a place to sit and watch the pattern of everyday life, to marvel at and try to understand and to be part of it for this short time, but you know you never will be afforded a place in the pieces of this puzzle, not properly. If you are not from here, the rush and the decay are not part of your makeup and this world will never be yours. The streaming scooters will weave and surge and the sloshing bowls of pho will be served long after you leave, but it's a privilege to be privy to this world for only a fleeting few days. 🔔 Little Hanoi Diamond Hotel £18+ (500000+ dong) A boutique style hotel set in the buzzing streets of old Hanoi but away from the louder night life spots. The staff were professional and friendly and the rooms were freshly decorated and clean. We upgraded from our £18 a night windowless budget room which we would not recommend to one with a balcony overlooking the street for £26 a night. There are stylish touches like double wooden opening doors, a large bath and heavy dark wooden furniture. We would stay here again.